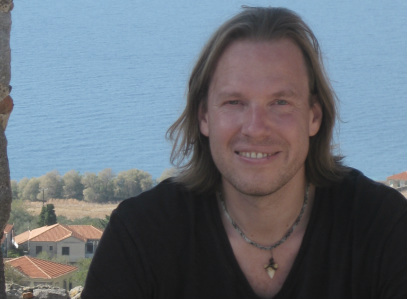 This is part of my series on Nicholas Everitt's The Non-Existence of God. I am currently looking at Chapter 1 of Everitt's book. In Part 1 I introduced the problem of religious epistemology: we would like to use the method of logic and evidence (reason) when assessing the credibility of the God Hypothesis but some religious intellectuals object that Faith gives us direct epistemic access to God. Everitt suggests there are three typical religious objections to reason: (i) it is blasphemous; (ii) it is irrelevant; and (iii) it is inconclusive. Let's look at each of these objections and see whether they are acceptable. Many figures in the history of religious thought have deemed the use of reason to be blasphemous. Why? Presumably because using reason to establish the existence of God would place reason on a pedestal over God. This is just wrong: God is primary, reason is secondary. [R]eason is the Devil's harlot, and can do nothing but slander and harm all that God says and does...Therefore keep to revelation and do not try to understand. Luther's distinction between the magisterial and ministerial uses of reason is embraced by one of the leading contemporary Christian apologists, William Lane Craig. The magisterial use places reason above God; the ministerial use directs that reason can only be used in support of God, not against him. Only the ministerial use of reason is allowed. This argument seems to make a virtue of faith. But is this an acceptable tactic? To answer that question we need to distinguish between two possible meanings of faith and show how both meanings tacitly rely on reason. The first meaning is the Lutheran fideism I have just described. This implies that faith is the tenacious rejection of reason: it is a belief accepted without supporting evidence. It is not clear that this is a coherent position to hold: it seems to be offering us reasons (the primacy of a revealed God) for rejecting reason. The incoherency is laid bare when we consider Luther's admonition that we must "keep to revelation". This admonition can only be made after we have reasoned our way to a particular set of beliefs. Consider: there are many proposed revelations (Everitt cites the claims of Peter Sutcliffe - the Yorkshire Ripper), if we are to "keep to" one of them, it must be one that we have first verified on the basis of reason. The second meaning of faith is perhaps more common. It is the suggestion that we accept a proposition not because we fully understand it, but because we think that a full understanding is available. For example, I accept that Fermat's theorem has been proved, not because I have checked the proof myself, but because I think it is possible to do so if one wishes. It is suggested that the typical religious believer is in the same position with respect to belief in God. They may be brought up in a religious community where everyone believes and where respected authorities suggest there is a sound basis to the belief. In such a situation, faith is a rational option. The problem with this understanding of faith is that is does not reject reason at all. It simply outsources or delays the use of reason. This objection can be given shorter shrift. It is the suggestion that reason is irrelevant to the God question because God's existence is not a rational belief claim like, say, claims about the existence of cats or dogs. Two noteworthy figures are associated with this type of objection. First, and most famously, Soren Kierkegaard who said belief in God was non-rational and that it would be folly to try to prove its rationality. A similar argument, grounded more in the philosophy of language, was developed by Wittgenstein. He argued God-talk was not operating in the same language game as cat-talk or dog-talk. That is: it was not something that could be assessed in terms of truth or falsity. These line of thought can be easily dismissed by considering the sheer volume of religious scholarship that does try to use reason to prove the existence of God. The library-shelves groan under the collective weight of works by religious authors who think God-talk is assessable in terms of truth and falsity. This final objection is popular among those dismiss the relevance of science to the question of God. It is the suggestion that reason is always inconclusive on the matter of God's existence. We can make use of it to a certain extent, but it will only take us so far. This is because there is no conclusive evidence to be adduced. No "aha" moment to be arrived at. We must first examine all the available arguments. Only then will we be able to say that they are inconclusive. Although the arguments might be inconclusive on an individual basis, they may work when considered collectively. 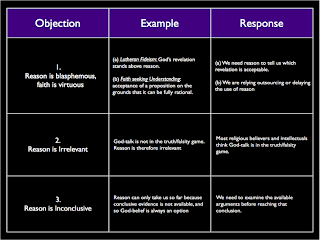 We have considered three classic objections to the use of reason when it comes to God. We have found them all to be unjustified or else tacitly reliant on reason. The image below provides the final balance sheet. In the next part of my summary, I will consider Everitt's views on the varieties of reason, their affect on our beliefs, and what our working definition of God should be.